Polysonics was the final event in a suite of activities bearing Nigel Helyer’s curatorial touch including the exhibition EchoSonics at UTS gallery (see review and video interview) and the concert Macrophonics II at Bon Marche (see review). For Polysonics Helyer collaborated with ISEA Executive Creative Producer Alessio Cavallaro and the six performances offered markedly varied approaches to electronic and digitally augmented music-making. The first performance by Shane Fahey and collaborators, Time—a token of Consistency, presented a music concrete investigation into the passing of time. A variety of timer devices are set up on drums by “horologist” Evan Carr and amplified. Fahey and David Carr then manipulate these layers of ticks, forming complex rhythmic motifs overlapping and merging in and out of one another. The visual aesthetic is particularly strong, the players positioned around a small installation of wooden boxes housing clocks and light globes accompanied by Honi Ryan’s video projected onto the skin of a bass drum. Here noirish shadows wait and pace, overlaid by images of a swinging pendulum, ticking clocks and the moon, beautifully textured and perfectly fitting on the drum’s surface. When the final timer goes off, the performance is over—neat and nicely done. Decibel from Perth performed in a cut down configuration featuring Cat Hope on bass flute and Lindsay Vickery on bass clarinet and Sydney-based guests Mark Cauvin on double bass and Jon Watts on laptop. 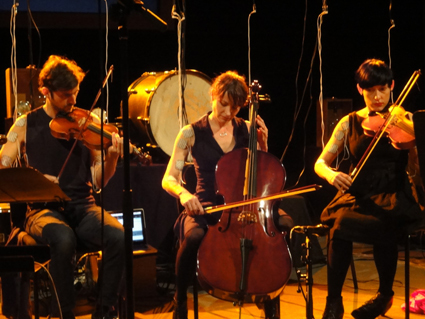 Using their custom designed app, ScorePlayer, the ensemble performed two new graphic scores projected for both players and audience to follow. The first, Silent Revolution by Lindsay Vickery, combines a notation of coloured lines with collaged black and white images of historical revolts that gradually become increasingly abstracted. The players are prompted to make short staccato eruptions developing into longer more intertwined atonal sequences. The rich rabble of sound manipulated by Watts on laptop near the conclusion of the score is particularly interesting as is its visual correlation of dense larva-like texture. The second piece, Lower Drawer by Cat Hope, consists purely of coloured lines dictating sustained tones and small pitch bends and glissandi. It’s a quiet and ambiguous piece—always in the process of becoming and never arriving, an intriguing effect that feels intimately linked to the scrolling mechanism of the score which creates a kind of self-contained chaos. Nigel Helyer has made known his dissatisfaction with performance laptoppery (see RT70), so it’s no surprise that the majority of the works in Polysonics involve physical, visual or installation components. Garth Paine’s set-up includes five robotic singing bowl contraptions that hang above the audience creating highly spatialised tolling and a series of auto-activated cymbals providing feedback sonorities. The core of the performance is Paine on flute, exploring its high and shrill tonalities (from where I’m placed, occasionally too shrill), which are then processed via laptop and augmented with ambisonic field recordings, predominantly bird sounds. The result is a rich and multifaceted soundscape, reflecting a sense of chatter implied in the title Meditations on Conversation. Michaela Davies’ Involuntary Strings Project is one for your inner-sadist. Davies wires herself and her players to an electric muscle stimulation system. She then transposes her compositions into data which defines the minute muscle movements involved in performing the piece and transmits this back to her players. They are thus ‘stimulated’ to make the musical gestures that make up her music. For this concert she presents one composition purely for the involuntary quartet and two co-composed works (with Jim Sclavunos and Kyle Sanna respectively) which also include voluntary players. The combined voluntary/involuntary pieces are particularly interesting as they allow greater insight into the levels of motor control and intentionality, or lack thereof, among the players. The final piece, Untitled for Cyborg (by Davies and Sanna), explores this succinctly by swapping similar roles between voluntary and involuntary performances so we can compare the intricacies of gestural and sound performances. Leah Barclay’s Shifting Nature is purely a laptop performance (Helyer must have overcome his aversion) presenting a radiophonic journey through Australia, India, Korea, China and Brazil. Her recordings are clear and expansive, including insect sounds, voices, instruments ranging from didjeridu to tabla and even, we are told, sounds of the Amazon River Dolphin. Her processing and augmentation of the field recordings is sensitive, drawing out resonances and rhythmic subtleties. Despite the speaker distortion (it seems the audio engineers were unaccustomed to mixing for live performance), it was a rich audio travelogue. 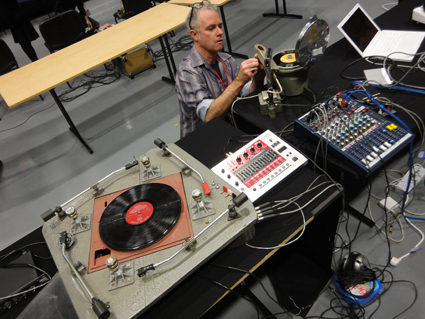 The final performance of the evening is a celebration of old technologies with Ian Andrews and Garry Bradbury (aka Sanity Clause) employing only turntable mechanisms to create their soundscape. However this doesn’t limit the duo to just playing records. On one turntable what appears to be a spring and marbles jostle together to form a rattly texture. They are later replaced by an oscillating plastic bowl. Andrews’ four-arm turntable simultaneously creates its own mash up of sounds while Bradbury drops the needle onto classic vinyl curiosities capturing warm crackly loops. The highlight arrives when Andrews comes to the front of the workstation and switches on an object, later identified as a centrifuge, on which a record spins wildly. The performance ends with the slow slurred tones of the vinyl as it finishes its deceleration. A perfect sonification for the end of ISEA2013. Polysonics offered a truly eclectic combination of artists. It was a shame the MC-ing by ABC Radio National presenter Tim Ritchie was poorly pitched for the ISEA audience, his cringe-worthy monologues evidencing a distinct lack of engagement with the music. While there was a marked absence of younger sound-makers (many of whom were performing at the First Draft Depot gig unfortunately programmed for the same night), the range of artists offered multiple perspectives on audio production and an impressive breadth of invention.